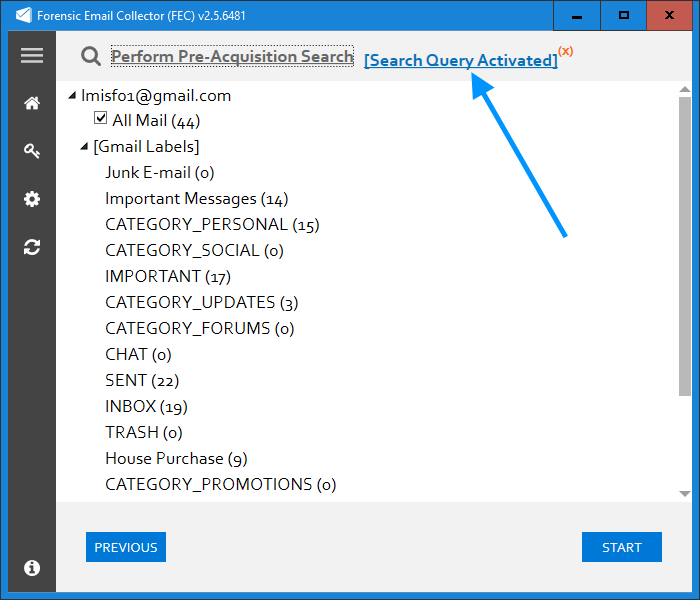 When preserving a Gmail or G Suite mailbox using the Gmail API, it is possible to perform pre-acquisition searches to narrow down the data set. 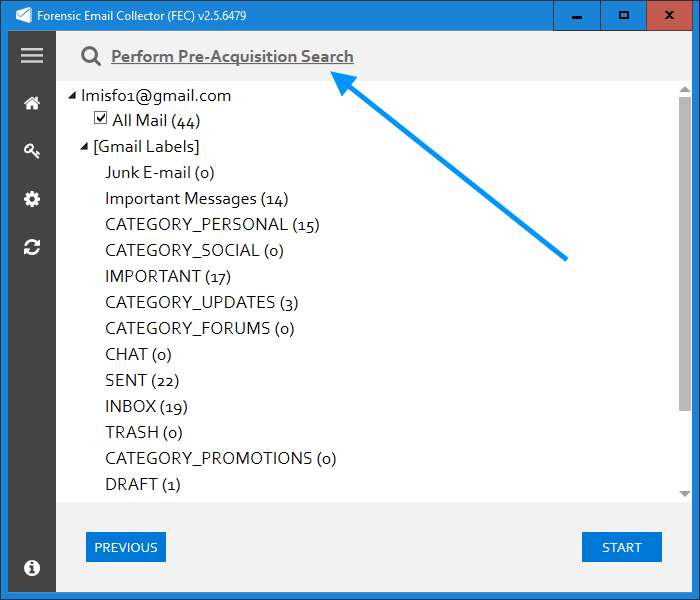 You can perform in-place searches in Gmail and Google Calendar by clicking the "Perform Pre-Acquisition Search" link as shown below. FEC allows you to execute your search query on the server side and preview the search results. Because FEC uses Gmail and Google Calendar APIs, the search syntax and functionality are identical to those of Gmail and Google Calendar search. In other words, the accuracy of the search results is dependent on the capabilities of Gmail and Google Calendar search. The visibility of each tab depends on the folder selection made in the folder tree before launching in-place search. If both Gmail and Google Calendar items are selected for acquisition, then both tabs would be visible. Pre-acquisition filtering can be a convenient way to filter messages using a long list of criteria. You can refer to Google's documentation on search operators you can use with Gmail for a comprehensive list of search operators and syntax. Messages containing an exact phrase — Example: "business meeting tomorrow"
Note: When referencing labels with spaces in their names, Gmail expects that the spaces be replaced with dashes. For example, you can search for all emails labeled "House Purchase" by using the query "in:house-purchase". When you use multiple search terms, Gmail search combines them with an invisible AND operator. In other words, the query in:inbox is:starred looks for items that are both in the Inbox, AND are starred. If you would like to perform an OR search instead (e.g., when searching for messages that have a list of labels), you can include an explicit OR operator (capitalized) in your query. For example, searching for in:purchases OR in:expenses would cause Gmail to look for messages that have either the "Purchases" or "Expense" labels. While Google Calendar API allows end users to perform searches, its search capabilities are different than those of Gmail. The search bar at the top allows you to enter free text search terms to find events that match these terms in any field, except for extended properties. It is important that you do not enter search operators such as "before:", "after:", etc. here as you would in Gmail. The two date pickers below allow you to filter events by their start and end times in Coordinated Universal Time (UTC). You could populate none, one, or both of these date parameters depending on your requirements. Once you have finalized your search query, you can save it by using the "Save" button. This will close the in-place search window and activate your query. You will see a notice as in the screenshot below. If you would like to clear the search query, you can click on the small (x) symbol next to the "Search Query Activated" text as shown in the figure above. The search functionality built into Gmail and utilized by FEC is limited to the documents that Gmail is able to recognize and index. For instance, a proprietary CAD file unrecognized by Gmail, or files inside an encrypted file archive would not be indexed or searched. Similarly, if a file has no extractable text (e.g., a scanned TIFF image of a document), Gmail would not be able to extract text from it or index it. Given the above limitations, it may be appropriate to use the Gmail search functionality in FEC to filter messages by their labels, or top-level message characteristics such as sender, recipient and subject content. Keep these limitations in mind if you plan to use this functionality to perform a blanket search intended to search all documents and their attachments recursively.